The New Space Opera 2, Gardner Dozois and Jonathan Strahan, eds. When Wilson Tucker coined the term “space opera” in 1941 to refer to “the hacky, grinding, stinking, outworn space-ship yarn”, he can’t have imagined the sub-genre would still be going strong sixty-nine years later. Or indeed that it would be considered one of the more successful forms of science fiction. That’s not to say that the “outworn space-ship yarn” no longer exists. There are plenty of examples of it being published in the twenty-first century. Some of them are even space opera. 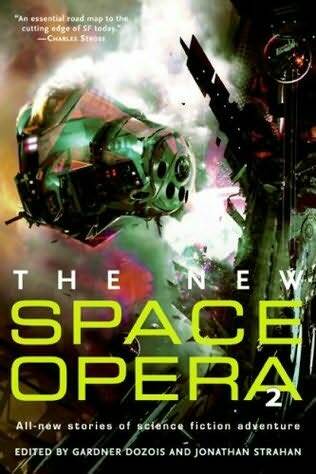 According David G Hartwell and Kathryn Cramer in The Space Opera Renaissance (2006), space opera never went away and merely evolved over the decades into the form we now call New Space Opera. Which is, of course, to completely ignore the British re-invigoration of the sub-genre in the 1980s and 1990s. Before there was New Space Opera, there was New British Space Opera. Of the nineteen authors in The New Space Opera 2, only three are British. Since this anthology is a successor volume and its publisher is American, this is not unexpected. Likewise the fact that eleven of the authors are from the US, with only three Canadians and two Australians. Science fiction is a US-dominated genre. It is, if you extend its definition to include some of the stories in The New Space Opera 2. Because from this anthology, the only possible conclusion is that the new space opera has not only morphed back into the old space opera, but it has also expanded to include a great deal more of science fiction. How else to explain the stories by Kristine Kathryn Rusch or Elizabeth Moon in The New Space Opera 2? Both are the sort of sf CJ Cherryh was churning out by the yard in the 1980s. Or Mike Resnick’s spoof tale, which may riff off Tucker’s original definition, but seems to miss the point of new space opera. While John Scalzi’s ‘The Tale of the Wicked’ may be space opera, inasmuch as it features spaceships, AIs and humanity at war with an alien race, it has neither the vigour, scale, nor inventiveness of new space opera. And Bill Willingham’s ‘Fearless Space Pirates of the Outer Rings’ is pure pulp sf, although its ending does drag it into the twenty-first century. Perhaps this is the way of things. A new movement injects vigour into a moribund genre, and is then subsumed by it. Which is not to say that science fiction was entirely moribund, nor that it has been wholly re-invigorated. There is still a whiff of corruption from some areas of sf. Happily, The New Space Opera 2 is mostly a good read. With contents provided by, as the back-cover blurb has it, “some of the most beloved names in science fiction”, the stories are readable and mostly entertaining. But naming any anthology after a movement – however arguable its definition – is a hostage to fortune. There are some good stories in The New Space Opera 2. There is some new space opera in The New Space Opera 2. There is even a small overlap between those two groups. But there are a number of pages which do not belong in either group. The New Space Opera 2 scores best at presenting a snapshot of science fiction in 2009. It is not an all-inclusive snapshot – for that, one of the many “best of the year” anthologies is needed. The New Space Opera 2‘s contents lean in a specific direction. But the good stories in it show what’s been good in sf during the past couple of years – those stories, for example, by Robert Charles Wilson, John Barnes, John Kessel, John Meaney, Justina Robson, Sean Williams and Bruce Sterling. No anthology will ever be perfect, no matter how “beloved” its contributors. The New Space Opera 2 improves its chances with its titular theme. For most readers it will have a higher than average hit-rate. But as part two of a manifesto for new space opera, its title does it few favours. This review originally appeared in Interzone #226, January-February 2010. Categories: book review, gardner dozois, interzone, jonathan strahan, science fiction | Tags: gardner dozois, interzone, jonathan strahan | Permalink.